In accordance with Horizon 2020, the EU Framework Program for Research and Innovation (2014-2020), innovative research and development solutions are to be advanced for social challenges, thereby reinforcing the industry and creating new workplaces. Digitization represents one of these social challenges. The digital roadmap of the federal government attributes great significance to science and research with respect to Austria’s development as an innovation leader for the purpose of supporting companies and shaping the digital single market of Europe. The University of Applied Sciences Kufstein Tirol regards itself as an important regional education and research institute while digital change is perceived as an important element of general social, cultural, economic and technological development. Strategic bundling of our university’s research activities constitutes the research focal point, which is supported by the existing strategic research management. Bundled individual research expertise is channeled into the research focal point “Human & digitization” with respective manifestations in technology, industry and society. 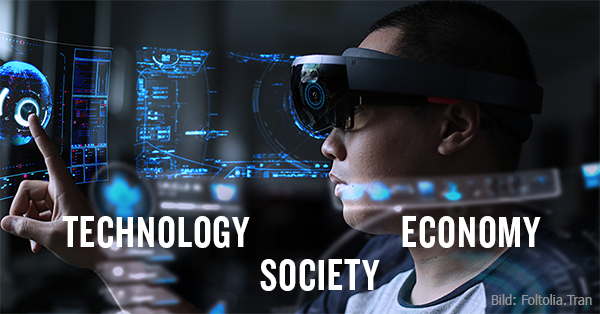 Research Focus "Human & Digitization"
Technological innovations and changes always impact industry and society as these are carried and lived out by companies and the people within society. The rapid increase of multimodal (web) content and meta information, advanced networking between digital and physical reality and the exchange in real time present tremendous opportunities and challenges of the 21st century. Support for digital transformation within organizations and society as well as the development of new business models are made possible through cooperative disciplines. The University of Applied Sciences Kufstein Tirol promotes increasing interdisciplinarity in data description, analysis, interpretation and processing. Likewise, we regard the design of customer interactions, learning experience and service design in communication, training, education and customer management as a central topic. Our researchers in applied informatics, real estate management and energy management as well as business administration and engineering cultivate new technologies for product development, energy supply, infrastructure and production processes specifically for small and medium-sized enterprises. We believe that supporting the commercialization of innovative products and solutions is important such as specifically the technologically supported development of real estate through building lifecycles in order to achieve high user satisfaction. Our researchers in economic, cultural and social sciences examine the dynamic (reciprocal) relationships between individuals, organizations and systems within the context of digitization. Prominent research interests encompass challenges such as company formation and management as well as questions related to company financing, restructuring or also the examination of sports and culture within the context of social tasks as e.g. inclusion. We also address general questions of (good) governance and sustainability in organizations and institutions or discuss the significance of events for economic development and social cohesion.